Bear with me, I haven't done one of these... (I hope the links and buttons all work.) Anna is a friend of me from the DC Modern Quilt Guild. So I decided, what they heck, I'll play along. Anna is doing the blog hop to generate blocks & to fund treatment for her M-I-L's breast cancer treatment. You can donate at this go fund me site directly. (If the buttons below and up just being pictures, Anna - at Life so Crafty will work under May 10 or right here. Insert sheepish grin.) Anna will be hosting a give-away on August 2 for anyone who participates in her cause (monetary contributions, pink blocks, participants in the blog hop, and reposting about the blog hop). Now to go make that block. 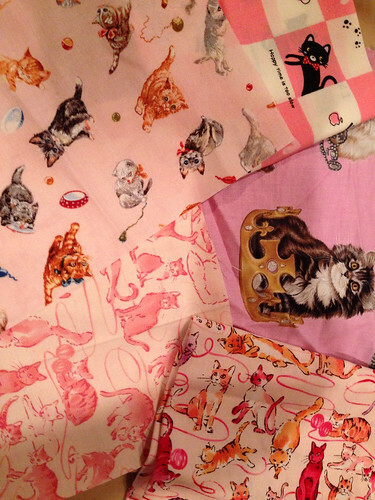 Oh look, I easily found 5 pink cat prints. I'm going to use the one with the crowns because I goes best with my background & star point fabric. 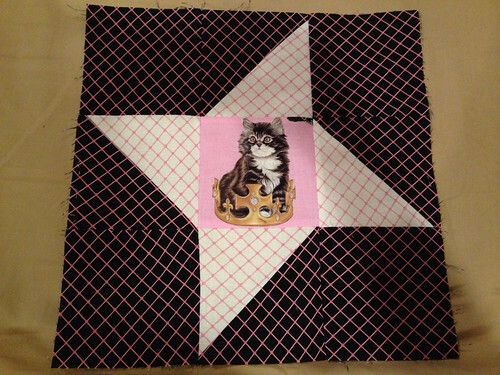 After having to relearn how to thread the featherweight & after having to unsew 4 seams, here is my friendship star block. BTW You can send a block too - if I didn't mention that above. Check out Anna's blog for the how-to. & I really am sorry if the spacing, adding spaces, all went haywire. It looked ok in draft.